by John W. O’Malley, SJ. 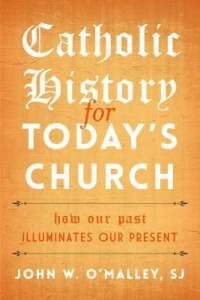 In his most recent contribution, “Catholic History for Today’s Church: How Our Past Illuminates Our Present,” Father O’Malley offers a collection of his articles and addresses from the past 15 years. These are intended to clarify the present state of the church by examining its past: the good, the bad and the ugly. A wide array of topics are covered here that bring the reader across time and space to consider the challenges that the leadership of the Catholic Church has faced as well as the process in which matters were settled or intentionally left open. Captivating stories of a number of the popes, the opportunities and difficulties of approving new translations of the vulgate, celibacy in the priesthood as well as a summary of the great councils of the church and what they did and did not decide. In his section on the “myths, misunderstandings and unintended consequences” of the Council of Trent, Father O’Malley astutely points out that while there is no such thing as a “Tridentine liturgy” in the sense that the Council of Trent created a new liturgy or even issued anything that we might recognize as a decree on the liturgy, there were grave errors in the various translations of the rites in the age before the printing press. Many textual discrepancies were thus propagated with the advent of the printing press that had to be addressed. Father O’Malley is a skilled writer who has the ability to explain complex ideas in a way that the average layperson can not only understand, but also appreciate. He opens a window to the reader by placing them in the historical setting of the issues he addresses so the tensions of generations past become relevant. One area that is not without some controversy is his discussion of the hermeneutic of discontinuity and rupture between the Second Vatican Council and previous councils, in which he cites that civility is critical. One wonders what the language of civility means; depending upon what side of an issue the person is on the other side he or she can be accused no doubt of being “uncivil” as opposed to being unscriptural or unprincipled or downright false. Those who take this journey with Father O’Malley will be treated to history lessons from one of our country’s treasured professors and will be taken on a brief tour of the author’s own journey from a humble and loving home to the high places in academia. Wright is academic dean for evangelization for the Diocese of Paterson, New Jersey.